Great news! The always fantastic Walter Jon Williams has a reprinted story in the new issue of Clarkesworld Magazine, that I had never read before. “Daddy’s World” starts out idyllic and slowly gets more dark and demented. Until it finally gets just insane. In some ways, “Daddy’s World” feels like a callback to a lot of our favorite cyberpunk stories, like Everyone in Silico, the Ware tetralogy, and some of Williams’ own early works. But it’s got a pretty unique flavor, and it’s worth spending half an hour reading this afternoon. One day Jamie went with his family to a new place, a place that had not existed before. The people who lived there were called Whirlikins, who were tall thin people with pointed heads. They had long arms and made frantic gestures when they talked, and when they grew excited threw their arms out wide to either side and spun like tops until they got all blurry. They would whirr madly over the green grass beneath the pumpkin-orange sky of the Whirlikin country, and sometimes they would bump into each other with an alarming clashing noise, but they were never hurt, only bounced off and spun away in another direction. Sometimes one of them would spin so hard that he would dig himself right into the ground, and come to a sudden stop, buried to the shoulders, with an expression of alarmed dismay. Jamie had never seen anything so funny. He laughed and laughed. His little sister Becky laughed, too. Once she laughed so hard that she fell over onto her stomach, and Daddy picked her up and whirled her through the air, as if he were a Whirlikin himself, and they were both laughing all the while. 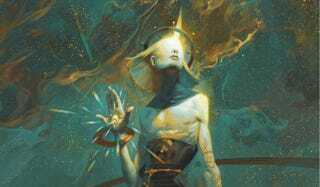 Read the rest of the story over in Clarkesworld.